Hog farmers in Iowa and South Dakota are rapidly catching on to the advantages LED lighting can bring to their operations. Energy efficiency tops the list, followed by longevity. These farmers have a lot on their minds besides lighting: manure storage and disposal, ammonia buildup, artificial insemination strategies, etc. Their concerns with lighting are mostly about how much the energy costs to keep the lights on and how long the lamps or fixtures last before needing to be replaced. A hog barn is a challenging environment for lighting. The atmosphere can be corrosive. The barns are power-washed several times a year, so protection of lighting fixtures against water ingress is essential. For this reason, CFLs are usually installed in "jelly jar" screw-in fixtures. The problem is, the enclosed operating conditions heat up the CFL bulbs and drastically reduce their lifetimes. This presents a problem, because replacing light bulbs is daunting in a facility in which the floor may be grated and is probably slippery, and large animals wander around a ladder's base. 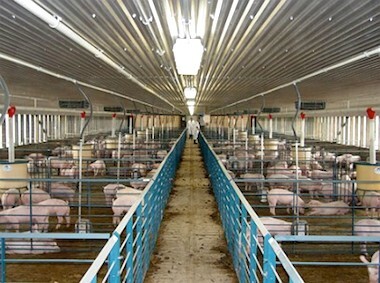 About 10% of Iowa hog barns have switched to LED lighting from the compact fluorescent solutions in use in the bulk of hog production operations in that state, according to MidwestEnergyNews.com. Around 10% to 15% of barns still cling to incandescents, and the rest use CFLs. That website interviewed Jason Prochaska, president of Sitler's Supplies, a lighting supply company based in the heart of Iowa's hog country. Prochaska said his company "has been doing a ton of projects" on hog farms since it began selling a combined LED fixture and bulb around 18 months ago. He estimated that nearly 10,000 units have been installed in hog barns. The AgriShift MLS Swine Light by Once Innovations was introduced in May 2013. It now costs around $40. It replaces a 100W incandescent or 23W CFL while consuming 14W, screws onto the standard "jelly jar" fixture for installation, and features IP66 water resistance. It has a "dim to red" feature that the manufacturer claims reduces stress in the hogs and provides a "night light" for their human caretakers, as the hogs don't perceive red light. The Agrificient LED from Energyficient Lighting Systems appeared in July of this year. It costs $50 and boasts active thermal management (read: a fan), a 1000-lm output at 71 lm/W, and a six-year warranty. It claims to be the first agricultural swine light listed with the Design Lights Consortium, and so eligible for energy-company rebates. This infographic goes through a financial calculation vs. CFL over about seven years. ROI is achieved in about half that time. Of particular interest to the livestock sector is LEDs' ability to mix chips of multiple types of LEDs in a single product. This can lead to a light source that is tuned to an individual species' needs. Research has already been done to reduce aggression in chickens by altering the light color with LED lights. Studies have documented the impact of light intensity and duration on gilt [young female pigs that have not yet been bred] development and cycling, especially in the fall as daylight decreases. Light does affect onset of puberty and length of breeding periods. In short, research into whether LED light provides any comparative advantages for hog growth and maturation, as compared to incandescent or CFL alternatives, is not as far along as it is in areas like poultry production and, of course, for many specialty areas of vegetable and plant growth, as we have discussed here.